When scouting for a location for the premiere of Jason Bourne, Universal Pictures chose Las Vegas, an obvious choice since it’s the scene of the film’s climactic and chaotic car chase. But finding a venue large and grand enough to launch the film was another matter – there aren’t many movie theatres that can accommodate the thousands of celebrities and industry insiders expected to attend. Knowing that CinemaCon, the theatrical exhibition industry’s largest trade event, is held each year at Caesars Palace and that screenings are successfully done in the Colosseum, Universal felt confident that the 4,000 seat venue could provide a fitting launch pad for the new $120 million action thriller. The bigger challenge: the Colosseum was never built as a movie theatre. Converting the massive room from a live performance space for the likes of Celine Dion and Rod Stewart into a cinema is a huge undertaking. Fortunately, there are experts who tackle the feat each and every year. Since Universal has relied on projection and sound specialists Boston Light & Sound for over 30 years for major premieres, they were the obvious choice to produce the event for Jason Bourne. And BL&S principal Chapin Cutler had no hesitation about who to recommend for the audio system: QSC. Working with the Bob Sandon, technical director of the Colosseum, and his highly skilled crew, the technical team from CinemaCon was thus reunited in Las Vegas to once again transform the Colosseum into one of the world’s largest movie theatres. Since the Colosseum is not technically a movie theatre, for cinema presentations a perforated screen, digital projector, and complete cinema sound system must be brought in and temporarily installed every time the Colosseum is used for movies. For the screening of Jason Bourne, a 7.1 audio system was installed, consisting of three screen channel loudspeaker arrays at Left, Center, and Right positions behind the screen, twelve subwoofers on the floor, with four surround channels coming from 22 loudspeakers around the seating perimeter. 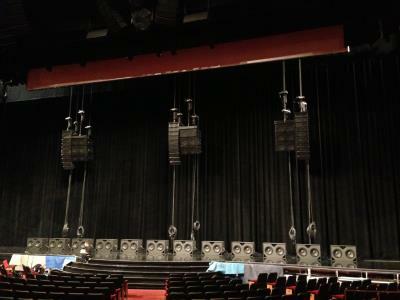 Since most cinema loudspeakers are designed for standard theatres that are rarely longer than 100 feet, QSC used its WL2102s WideLine line arrays suspended behind the screen to reach the farthest seats in the 120-foot Colosseum. Although line arrays are not typically suited for the architectural design of conventional movie theatres, in this case, the wide horizontal coverage provided by the line arrays proved an ideal match for the Colosseum’s semi-circular seating area. Surround sound was delivered by sixteen QSC SR-5152 and ten QSC SR-1030 surround loudspeakers along the side walls, and six stacks of three WL3082 WideLine loudspeakers with GP212-sw subwoofers positioned along the rear of the mezzanine seating area. QSC DPA-Q Series power amplifiers were used throughout for all loudspeakers controlled by a Q-SYS Core 3100 processor for all signal processing and routing. For projection, BL&S chose the Barco Alchemy DP2K-32B projector, receiving digital content from a Dolby/Doremi ShowVault server. Images were projected on to a 70-foot Harkness Perlux 180+ screen. Jason Bourne premiered in Las Vegas on July 18, 2016 at the Colosseum at Caesars Palace, a venue known well to QSC. It’s the fifth film in the Bourne franchise that’s based on characters created by Robert Ludlum and has grossed over $1B worldwide. Jason Bourne was number one at the box office over its opening weekend, and has already grossed almost $200 million worldwide.